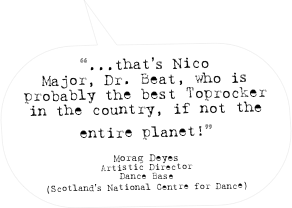 Nico Major (aka DR BEAT - aka SKRAMBLE / SKRAMBLED LEGS) began dancing and performing at 5 years old, as a member of several of Edinburgh and East Lothian’s many Youth Dance and Youth Theatre companies, with his first professional theatre performance at 10 years old and several small TV appearances throughout his teens. 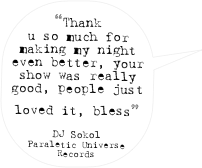 The experiences of those early years coupled with an introduction to Hip-Hop music via mixtapes, being passed around at High School, were the primer to a future lifestyle and vocation as a Hip-Hop artist & practitioner. 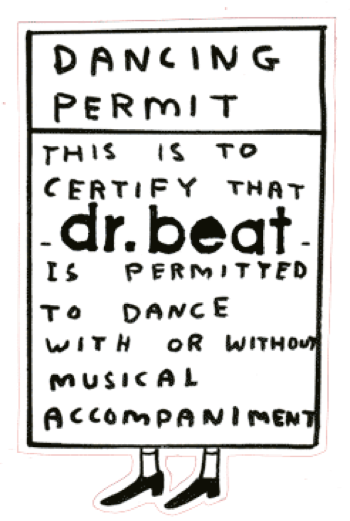 In 1997, the Hip-Hop fever took full hold and he was diagnosed with "Happy Feet". 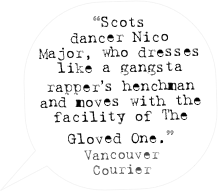 Initially trained in Breakdance & Hip-Hop dance styles and also as a teacher by Freshmess, he was further schooled in both Hip-Hop art forms by many of Scotland’s original underground Hip-Hop scene and periodically through masterclasses from some of Breaking, Rocking, Popping & Locking’s original pioneers and current world-class dancers including – Storm, Poe One, Ata, Alien Ness, Freeze, 7 Gems Rock Division, The Electric Boogaloos, Reveal, Frankie Flav, Gemini & Dyzee. 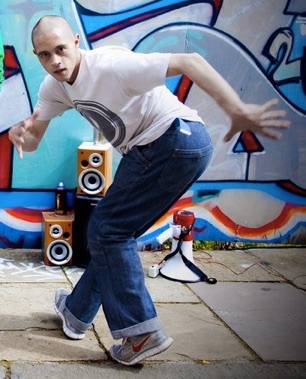 In 2007, he was one of the first people in the UK to receive certified teacher training in ‘Bboy Foundation’, and in 2010 ‘Bboy Foundation & Style’, taught by the world-famous Bboy legend, Ken Swift (7GEMS/Rock Steady Crew) through ‘The Pioneers’ programme run by Breakin’ Convention in London. INFO multi-award winning short film by Louis Paxton. INFO produced for music tv show, Ignition (BBC Choice). INFO a personal dance development residency exploring the art of freestyle/improvised performance. 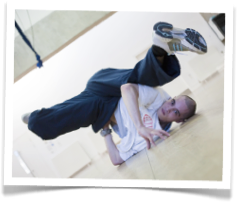 INFO a personal dance development investigation into the art of freestyle/improvised performance. INFO a double-bill of company devised dance theatre by Scottish dance company, Freshmess - specialising in a unique of fusion contemporary dance & breakdance.